The following item comes from the January 2016 issue of Syncrude’s eNews. Through the development of super pumps over the last three years, this hydrotransport system at Aurora has gone from having three major pump outages a year to just one. An added bonus to less downtime has been a cost savings of approximately $3 million a year in maintenance costs alone. Developed by Syncrude, hydrotransport technology involves adding warm water with oil sand to create slurry, which travels via pipeline to the extraction facilities. In the pipeline, the bitumen begins to separate from the sand and water. Slurry pumps, like the super pump, provide the pressure to keep the oil sand slurry moving. Syncrude’s Mildred Lake mine is located 40 km north of Fort McMurray, AB, with the Aurora mine located 75 km north of the city. Through extensive research and data analysis, the team discovered the Aurora pumps were experiencing significantly more damage than pumps at Mildred Lake. This was due to moving more material, and a different slurry preparation process that has twice as large rocks in the slurry. 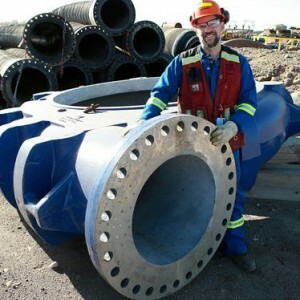 The key to Syncrude’s super pump is a larger impeller turning at a slower speed. Dan and his team determined the kind of equipment that was needed to increase the lifespan of Aurora’s slurry pumps. Armed with the right information, the team set out to design a pump that would run for 6,000 hours with the goal of having only one major outage a year. The design incorporated an 215-cm diameter impeller, which was 50% larger and three times the weight of the original. The increased size of the impeller allows it to rotate 35% slower than before while maintaining the same level of output pressure and flow. Lowering the speed helps to create less impact from the large rocks and clumps of oil sand, resulting in significantly less maintenance. A priority for Syncrude’s research and development team is to improve the production process and streamline operations. By installing the super pumps, Dan and his team were able to discover ways to increase reliability of Aurora’s hydrotransport system. To learn more about Syncrude’s R&D programs, go to research.Syncrude.ca.